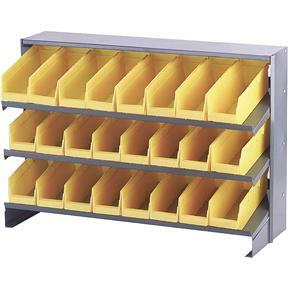 Twenty-four plastic bins, each measuring 10-1/4" deep x 3-1/2" wide x 4" high, fit onto the conveniently angled steel shelves. The bin unit has overall dimensions of 33" wide x 23" high x 13" deep. The bin kit can sit easily on a workbench or inside of a cabinet.